Foliage emerges a bronze colour before turning a mid green, oval and deeply veined or textured. The flowers appear on bare stems and hang gracefully in racemes around 5 cm ( 2 inches ) in length. Flowers are fragrant and last well on the tree. The plant is shrub like, multi stemmed and easy care in a well drained soil. After planting water well and mulch around the plant to maintain a cool moist root run. Spread – Over time it can reach 2 metres. Position – Full sun to dappled afternoon shade for good flowering. In warmer climates part shade is best. Flowers – Pale golden yellow. Flowering period – Late winter to spring. Pruning – Although pruning is not generally required, you may wish to prune by taking a branch section to use as a cut flower arrangement in winter. Tip pruning is not recommended as it tends to destroy the natural shape of the plant. Ogon (syn ‘Aurea’) is a golden leafed variety. 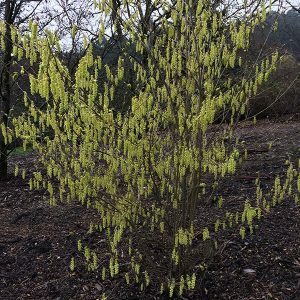 ‘Golden Spring’ is another with golden foliage in spring. Excellent in the garden border where it adds colour in winter and works as a background foliage plant from spring through to autumn. With fragrant flowers it can also be used in a sensory garden. This is an easy plant to propagate by cuttings taken after flowering. 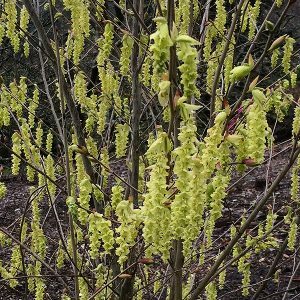 Corylopsis spicata or Spike Winterhazel is available for sale from the following nurseries.